During the night, brooding, it occurs to me that Conscience is the smallest part of the female anatomy. You are right about Wikipedia; they are controlled by a hostile mob. Nuff said. ALBERT asks my plans for the next months, as he will let the Key West apartment to one of his workmen meanwhile. I reply: "I shall stay in London until late September, then fly direct to Atlanta, probably. Hope your workman respects my private property like the television. Your firemen were rather disrespectful of my bike, I recall." Albert does not take my concerns about very seriously. "You are too materialistic. Consider the lilies of the field, they toil not, neither do they spin, but, behold, Solomon in all his glory was not arrayed as one of these. You need to think of others and stop thinking of SELF. My mother told me that people need to do this and I immediately agreed. However, I have spent my life looking for people who will think about my needs but they are hard to find." G. WANTS the driver/assistant job for October and November, and sends a photo from Lima. She looks like she's still smoking. Challenged on this, the Piranha replies: "I haven't smoked for three years now." I won't employ smokers. If it is true, I am impressed, but sceptical: "Not smoking. That is good news. . . In a few hours' time I drive north with Jessica from southern Spain. I arrive back in London in three days." I DRIVE all night and arrive at Madrid airport, Terminal 1, at five a.m. Jessica's flight is 7:50 a.m. and after she checks in I drive on northwards alone. I halt for the night at La Puebla, near Vitoria. It's a nasty hotel/pension, and not cheap, but I am tired. I find a way of going on line; there is an abrasive email from P. waiting for me, ending: "If you are going to respond with your usual one-liners, don't bother." Around midday I reply nonetheless: "I have been driving all night so this will not be long. I had to get Jessica to Barajas airport before six a.m."
MY European friends have begun asking about my talk to students in Belgium, in September. But it is a private function, and there is not much I can say. In fact I don't know myself. I doze on and off during the afternoon. Then comes an e-mail woo-hoo from Jessica, who is back in London and already installed at H.'s desktop computer, by the look of it. Oh gosh. Just got my grade break-down, I got 396/400 marks in English -- only four marks off a full 100 per cent which is near impossible! Had some disappointing modules in Biology but an overall A. Nearly a full house in English? Wonder whose genes that reflects. Not much Australian in her, that's clear, or Danish either for that matter. "Very impressive," I congratulate her. "I wonder how you did it. Just slept two hours in this room, which of course stinks of cigarettes." Conditions: You dress well, your hair is perfect; you obey all my orders and don't pick fights. I pay your meals. She replies at once. Doesn't like what I am offering. She earns more than that every day in Peru. Hugo asks about my forthcoming talk in Belgium. "Sounds like it's gonna be an interesting talk. What are you going to talk about?" "Foreign affairs," I joke. "Jaenelle and Gerwich." His reply is unprintable. [----] has sent a large contribution from Illinois, which is very useful right now. I thank her: "I am halfway through a fifteen hundred mile drive back to London. Onward through France in half an hour's time. Back in London tomorrow night, God willing." I am getting more and more piropos about my talks, which people have viewed on YouTube. There are over two hundred films there, it seems. It is a mystery to me. I don't know who puts them there -- I don't. Björn K. writes from Iceland: "I know, and knew after only a few minutes of watching you on YouTube, that you are in the group of the very few humans I regularly watch to get inspiration and entertainment." He adds a P.S. : "Would be interesting to see you here in Iceland some day. I doubt you would receive anything but open and welcoming attitude." I tell him I am not averse, but a group would have to invite me. At eleven a.m I start a mail-out for my lecture sweep through Florida. I leave the hotel at eleven-fifteen a.m., grab a coffee and am on the autopista at eleven-thirty heading north again. It rains heavily most of the way through Basque country. Their highways signs are now mottled with supplemental directions in the Basque language. As bad as Wales or British Columbia: catering to a tiny minority and increasing the traffic confusion just when drivers need to concentrate most. The Basque language seem to be overloaded with the letter Z. Amazing that the Scots have not yet decided to include Gaelic or some other language alien to us Sassenachs in their signs. It is purely malicious, and might yet win them a few home votes. In planning today's return trip I have overlooked that it is the last Saturday in August, and the French highways are blocked with holiday-end traffic. Endless nose-to-tail traffic jams all the way from the frontier to Poitiers. Bouchons. The kind of jams where traffic inches forward for ten miles, or halts altogether. I may have to rethink tomorrow's times. I send a couple of messages to Jessica, who confirms she has made my bed and bought some supper ready for my arrival tomorrow. At eight-fifteen pm I finally reach the hotel at Poitiers. I check the emails. The Florida mail-out has brought in a heap of registrations, and loads of advice on the now rectified engine problem with the Skoda. I write to Paloma: "On to London tomorrow. Please tell Pilar Jr happy birthday from me. Daddy." POWERFUL, if implausible, dreams all night long -- coming home in a Mirage jet, etc; but I see that there are other passengers also, and the female traveling with me is (after some half-awake pondering by me, trying to place the face) Steffi Denker, the goodlooking DDR television announcer, with whose young family I always stayed in Köpenick (East Berlin) when researching in the East German archives in Potsdam. I have not thought much about her at all for thirty years, after she betrayed my friend, her husband Detlef, to the Stasi (so I was told by Valeria Varga, her bosom friend from Budapest). The things one finds, e.g., a letter from the head of agriculture at Auschwitz to [Himmler's adjutant Werner] Grothmann in November 1942 saying that the director of the camp's Agricultural operations plans to send Himmler a set of tyres for Christmas. These will be made from rubber extracted from home-grown Russian dandelions. The writer asks for the size of Himmler's car tyres and begs the recipient to give no hint of the matter to the Reichsführer. What one might call braun-nosing? The travails of your Skoda remind me of the time my artist uncle and I picked up a hire car at Malaga airport late one night. We then headed for our hotel in Mijas, one of the mountain white villages, before heading northwards into the real Spain for a month's painting. However, as the road to Mijas grew steeper, so the car, a deux-cheveux, crawled ever more slowly, even in first gear, until it eventually gave a cough and stopped. Luckily we found the car could manage the climb in reverse gear so I drove almost the whole way up to Mijas in reverse, along what had now become a steep and winding single lane with a shriekworthy drop on one side whilst my uncle knelt on the back seat with a torch (it was pitch black), peering out of the rear window and guiding me ('Gently to the left now. No, left. I said! LEFT!'). The night porters stared in silent astonishment as we entered the hotel gates backwards with my uncle smiling through the rear window. I GET to Calais two hours ahead of schedule. The highways today are empty. The French toll roads are blacktop, of spectacular smoothness, and worth every penny of the toll charges in my view. The Tom-Tom GPS went haywire again yesterday coming across the Pyrenees. I have formed the view that this is not a machine defect; the same thing happened with my Magellan GPS in Iowa, piloting us -- G. the Piranha and myself -- nearly into mid-Mississippi in full flood at three a.m. one dark night. Significantly I have noticed that three times when I went along a certain road in Iowa, at the same spot, the GPS went haywire, and the arrow meandered across open countryside for several minutes until suddenly snapping back into the correct position. I suspect that governments are laying localised cross beams near strategically important sites that they don't want GPS-guided missiles to find that easily. The purpose of the local fake radio signals would be to confuse the math or operating algorithm for any GPS picking them all up. Maybe I am just a conspiracy-freak. But I am not stoopid. After all, when Hermann Göring's Luftwaffe started using their KNICKEBEIN beams in 1940, and then their X-Gerät, for night-bombing operations, we rapidly devised a technique of throwing up add-on beams which had the effect of significantly "bending" the Nazi beams. One air raid aimed at Belfast hit Dublin instead. I have arrived at Calais early enough (2:45 pm) to take the 3:20 p.m. ferry which is boarding immediately. About five hundred cars pack into the hold, their busiest day of the year, they tell me. Comfortable lunch, then I stand on deck and watch the White Cliffs heave into view through the Channel mists, always a proud, moving moment for an Englishman, or an "Ancient Brit" as I call myself. I wonder if the Blacks, our more Recent Brits, feel the same way. I search the clifftops for the CH (Chain Home) towers erected in 1940 for radar and guiding Bomber Command. My mind's eye keeps snapping back, like that GPS, to similar happy moments with J., when we returned by the same ferry from our motorized forays into the Continent, including our dangerous and forbidden research trip into Germany. It is vexatious to say the least. I arrive back in London three minutes before schedule. Jessica is out. I unload and go online. No messages of note. 7:12 p.m to G.: "By the way, my leg is now perfect and gives no pain at all. Me han hecho la operacion en enero. Ahora todo es metalico. Una pierna bamba [Peruvian slang: fake]. Does not even need any lubrication." Just joking. I'm sitting in my apartment after returning from driving around to see how my properties are doing. This is the biggest NOTHING. The Weather Channel is on. Looking at it and other channels I'm reminded again of just how totally lacking in credibility the media are. There is virtually nothing happening in Key West. The media just babble, babble, babble about how it's "going to be" a hurricane, a "hurricane watch is in effect", Governor Scott is appealing to people to remain calm, President Obama has assured us that we are "in his thoughts" in this desperate hour. And so on. Meanwhile, the journalists are blaring away at the Southernmost Point marker, Duval Street, and Mallory Square informing the world about how devastating all this is. While this nonsense is being broadcast, the bars are still open, have no plans to close and are jammed with people slurping down their drinks. Maybe by Tuesday this subject will drop and they'll revert to the usual breathless accounts about Assad conquering the world and (unlike the sainted Abraham Lincoln) "firing on his own people" and if we don't increase the Pentagon's budget immediately by fifty percent and send in the troops to Syria and Iran, we'll all be bowing to Mecca next month. I pretend not to understand. "Gosh, I hope my television and bicycles are alright. Just saw the news here in London and was about to worry about my possessions, when your email arrived. Saw your governor pontificating about the crisis, but I was glad to see he was flanked by two Obligatory Blacks for the benefit of the cameras." 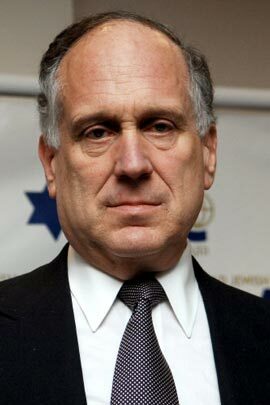 MULTI-BILLIONAIRE philanthropist and Auschwitz-benefactor Ronald Lauder (left: "Why us?") bleats that rightwing politician Heinz-Christian Strache is a danger for Austria (Strache has published a primitive cartoon about a fat multi-billionaire banker, with Star-of-David cufflinks). 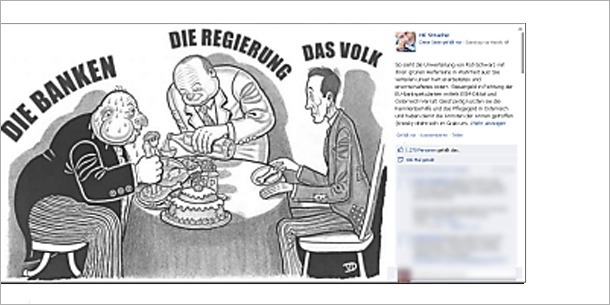 Lauder states that the cartoon is reminiscent of the antisemitic illustrations printed by Der Stürmer in the Hitler era. He has evidently never seen the latter: the craftmanship that went into the Stürmer caricatures is even today technically on a par with the cinematographic expertise of the pioneering Leni Riefenstahl documentaries. None of Stürmer's Jews has the handsome, benign features of a Ronald Lauder, but everybody in Europe of that era recognised who they were meant to be. The problem is that the Ronald Lauders of this world, or their ruling body the World Jewish Congress, do not address the question at its root. It is this: Is there any element of truth in the allegation hinted at in the caricature, and if so what should they be doing about it within their own ranks? 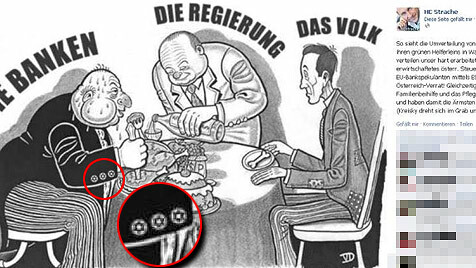 For example: Is it a coincidence that the top men in the recent Barclays rate-fixing scandal, which involved fixing international inter-bank interest rates raking in trillions of dollars, were all, so to speak, wearing cufflinks with the Star of David hidden on them, even if the media, for evident reasons (advertising revenue, and in Germany/Austria the public prosecutor), fought shy of actually mentioning it? It was the same with the convictions of the Guinness Seven back in the 1990s. All of them had English names (Ronson, Saunders, Parnes, etc. ), or had adopted them. But the cufflinks were there, so to speak, all the same. A public opinion poll in the USA after the near-terminal global bank failures began in 2008 found that two-thirds of those polled blamed "the Jews" for the financial collapse and resulting misery of foreclosures, repossessions, and joblessness. Immaterial whether that perception is true or not. If I were a Jew, that figure would scare me -- and I would begin looking around for another country willing to have me. Back in the 1930s, when we last saw this problem, there weren't many countries stepping up to the plate in that respect. As the archives now show, Governments saw "the Jews" as a plague, and you don't invite the plague in. At midday "Robert Richard," a freelance journalist, phones from a withheld number, wanting to interview me, for offering, he says, to The Guardian. Sounds very iffy. A search for the name brings up a total blank on Google. He sounds possibly Jewish, a North London accent, but maybe I am getting paranoid. 4:22 p.m long chat with G. She again says she has not smoked for three years. She reminds me it is eleven years since we first met. She would have to return to Peru by December. I DRIVE out to Slough (about which poet-laureate John Betjeman wrote during the war, "Come friendly bombs, and fall on Slough! It isn't fit for humans now. . ."), pick up my microfilm printer-reader from the warehouse, and go on to Eton in the Pigmobile to post today's parcels. I mailed Rommel (the Ullstein Edition) to you yesterday, it should arrive in next few days. Until I can arrange a Sicherheitsleistung [bond] of 25.000 euros we cannot get the injunction [against the German television company TeamWorkx] active. That is quite a problem. Fortunately my lawyer says I need only to find somebody with a German bank account who will write an irrevocable guarantee-document in that amount for the duration of the matter. Since we do not intend to violate the terms (i.e. produce and market commercial videos of their film, or publish the script, or aus der Schule plaudern) there is no real danger to the guarantor. But it is still a headache. I am working on chapter 26 of Himmler right now, and still homeless. Owen Foster asks: "Can you could recommend me any readings on Hermann Fegelein? In the Downfall film, of which I know you're not a fan, Fegelein is seen in his last moments shouting Sieg Heil and despite being a little drunk remains quite brave. But I have also read somewhere that he pissed his pants at one point? Have you written much about him (specifically his last days) in any of your books or are there any sources you would recommend?" Fegelein was close to Himmler, and married Eva Braun's sister Gretl. It didn't save him. I reply: "Fegelein was not a nice guy at all. When my Himmler biography is published you will see the details. I visited his brother Waldemar once in the 1970s. Hitler's other adjutants insisted that he be shot for desertion, while Hitler was minded to spare him. [Naval adjutant rear Admiral Karl-Jesco von] Puttkamer told me that, or even Fegelein's own adjutant Johannes Göhler, whom I knew very well." NEW Yorker Kim Lee has tried to buy stuff from our bookstore for $94 but his card is declined. His addresses have always been phoney in the past. We never got behind what he was up to. Why on earth the Bundesarchiv has permitted this geographical separation, God knows. I have begun reading the 35 microfilms of RSHA stuff obtained from the KGB archives, which I brought back from the USA (see right). 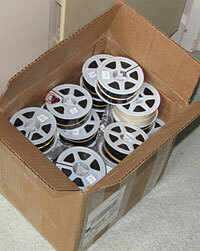 It is heavy going, takes two days for each film, around 2,000 pages. You never know what's on them, there are no files, frame numbers, or locations. I have retrieved my Canon microfilm reader-printer from the warehouse and am using it . . . I will pick you up at Heathrow (used to be called Thief Row). I am buying a sash-cramp today to work on repairing your easel. It seems Lipstadt obtained a copy of the memoirs from Israel, which had been keeping them under lock and key, for her defence in 2000 in the Disclosure. I reply: "I obtained them by hilarious means. As the Washington Post one morning revealed that the defence lawyers now had them, under the Rules of Discovery they were in their 'possession custody or power' and they were obliged by law to provide me with a copy. They refused, so I got the Judge to order them to do so by 4pm that day, which they did, with much gnashing of tooth." They handed them over on a floppy disc. Richard Rampton, her QC, then told me they had been unable to open the file. "Shouldha bought a Mac," I said. "It'll open anything." And it did; so I had the Eichmann memoirs, and they didn't.
. . . His 1956 memoirs were published by Sudholt Verlag (Druffel), at my suggestion. Nobody else dared touch them because of their revelations of Jewish collaboration with Eichmann in their own liquidation.
. I blame this phenomenon on the recession. News reports of big fires sweeping around Marbella, and Jessica tells me that Ojén has had to be evacuated. We got out just in time. MY current routine has become fixed: Deal with all overnight emails at eight. Manuscripting Himmler all morning. Brief snooze. 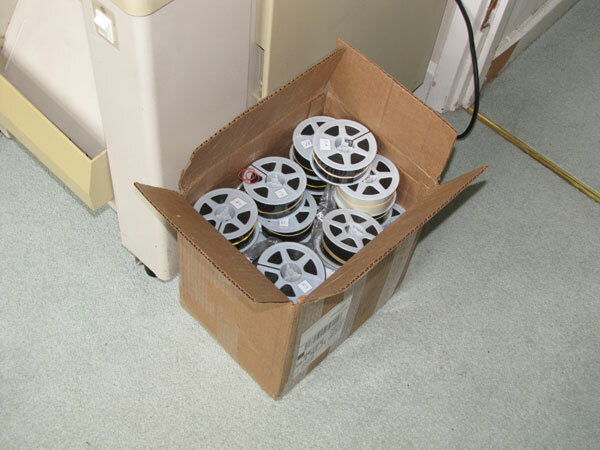 Read one microfilm per afternoon + evening (the machine is great, but it has to be hand-cranked as the motors are broken or a circuit board gone; I have bid for a replacement carrier on eBay. The auction expires in four days -- if I don't first, Dv. I GO shopping at Sainsbury's, with a pocketful of coins. With all the sleight of hand of a stage-magician, the Black check-out girl undercounts the pound coins by two pounds, "1,2,3,4, uh, 7,8,9" etc. Spot the gap. So I retrieve the coins and count them in front of other customers: I had given her the right amount. Loud protestations of innocence, to which I do not reply. If I accuse her of being innumerate, that would be racist; so, she is just a common Black thief. I cook the supper I have bought for Jessica, who arrives home in mid potato-steam. Frying-steaks from Ireland; they missed their vocation, they would have made good shoe-leather. She is terrifically excited about going up to University, and has read it all up with the same assiduous application as she read up on Cats when she had Sassy. What a star-daughter she is. In the Lipstadt trial you said something about Hitler's political testament being a forgery by a Swiss gentleman. Is this the testament that at one point reads "Above all I charge the leaders of the nation and their followers to uphold the racial laws meticulously and to resist mercilessly the universal poisoner of all peoples, International Jewry," at one point, or is that something separate? I reply: "Read the whole transcript. You will find I am referring to the 1945 bunker conversations which Hugh Trevor-Roper published as Hitler's Testament, nothing to do with the last will and testament of April 29, 1945 to which you refer. The former were forged." He thanks me: "I was a worried for a second. I had relied on the latter for part of my dissertation too!" R. comes up with unsolicited advice on dealing with the Missing Books. I reply: "I would never dream of doing that; that would be the action of what we old-fashioned English call a cad. She has obviously forgotten what she did with them. One day it will occur to her, I hope. Meanwhile we shall have to reprint them." I have read another Moscow microfilm today; it is hard work. 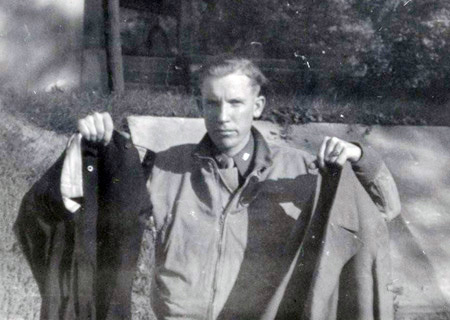 I AM concerned that Peter Bollinger of Phoenix, (right, with Hitler's shredded July 20 1944 uniform found in Eva Braun's possessions) Arizona has not so far replied to my letter, and I print it ready to mail to him again. Ronald writes from Berlin that Guido Knopp is retiring: "You met him in Aschaffenburg, many years ago," he reminds me. Indeed, and he came for dinner with us in London a few times. A private admirer, who of course never boasted of it! His dark hair was coiffed and piled high, now turned white. My father and I have had several discussions about your note to him. We would be absolutely delighted to visit with you . . . I spent the summer scanning my father's archives (at least a small portion of his memorabilia) into the computer. I scanned the photo of my father holding Hitler's uniform. The guy who pointed me to this Phoenix lead comments, when I tell him the good news: "Well I hope the mystery will be solved, or perhaps more leads for the EB and AH correspondence for you to follow." -- "Just as an aside David, it occured to me, whilst looking at the new picture, that a bonfire is behind [Bollinger], and that gravel path is much like your picture of the ceremonial burning of the trousers. I wonder if the July 20 tunic was kept from the flames....? Why burn trousers on their own? Just a thought, but wow, to think that's still about." I reply: "Yup, that is why I am going there." That, and meeting my friends. HUGO reports from Berlin: "Yesterday's Berliner Morgenpost," -- published by the pro-Israel Springer press -- "reported a 'disturbing increase' in the number of attacks against Jews in Germany. The latest victim is a rabbi who was set upon a few days ago in Berlin and ended up in hospital with a broken collar bone. As a gesture of solidarity with the Jews in Germany, various Prominente gathered in front of the Brandenburg Gate, all wearing kippahs. "What these foolish people fail to understand is that such hollow gestures serve only to alienate them further from those ordinary Germans who resent people whom they regard as aliens. The Prominente would do better to try to understand why a growing number of their fellow Germans feel that resentment. The danger is that, as long as the fears of ordinary Germans continue to be ignored, they will take matters into their own hands and resort to terrible acts like those of the [crazy and] disaffected Norwegian, Anders Breivik." In theory. But it would be a three-day outing. I would say, "I am not disappearing for ever," but that would be so like J's words . . . over breakfast in the Polonia Palace [Warsaw] a year ago, eye-lashes a-fllllllutter, and which have turned out to be less than true. R in Iowa has more time on his hands than I do: "Reading again the opening paragraphs of your autobiography, in the opening chapter, The Ring, I found some new words which my vocabulary probably would not use. My word processor could not define glister but an internet site did: "Glitter; brilliance. [Middle English glisteren, probably from Middle Dutch glinsteren or Middle Low German..."
I tell him to google "All that glisters is not Gold." We have started our summer sale on the bookstore: 20percent off until Sept 30. I WAKE with a jolt from deepest sleep as I hear Jessica coming into my room, looking for cash to pay her taxi. Grrr. There is none. I tell her to take the card to a machine. -- During the night, brooding on other things, it occurs to me that Conscience is the smallest part of the female anatomy. I laughed at the cover of your magazine with the professor mirrored smaller and smaller. Hard labor [with John Laing Ltd. in 1960: see left] always seems to be the most satisfying, each day having its own success and progress, as was yours with the concrete job. Writing, for me, is an intellectual "high," but it doesn't pay the rent. The "either/or" "turning point" scene is what I sometimes call a "magical moment." It is where the world seems to stop entirely, palpably so, and waits for one's decision on some important, life-changing situation; everything waits, as if in suspended animation, but not for long; then when the choice is made, the world starts up again, accepting the decision, and life proceeds along that line. A frightening moment, and sometimes nothing changes, but the excitement of change itself can be as fearful as the choice to move ahead or away. I looked up Entflechtungsbestimmungen: "unbundling provisions". Yes, that should explain it. I criticise his "people of color" remark. The population of the Iberian Peninsula are not considered "people of color" on this side of the Atlantic, that is a conceit of the White American. I live thirty miles outside Phoenix . . . I have been trying to videotape my dad talking about his childhood, political career, time in the military. I had planned to ask you if it might be possible to allow me to video part of your discussion with him. This year we will be celebrating his 90th birthday. I am hoping to edit his interviews and splice them with all the photos I have scanned. 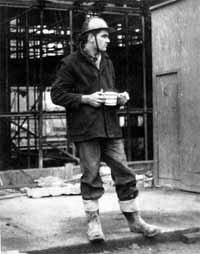 I will make sure to have Dad's WWII archives at my house. I didn't scan everything. This is getting exciting. I reply: "Yes that is fine, unless your Dad will still have stuff squirreled away in his house. We can go there too perhaps. . . I have set aside the rest of the day for this." A DIALOGUE goes on all day, started by G. in Peru. I work all afternoon and evening indexing film 6C of the Moscow KGB files, and find halfway through this film extraordinary material on the pre-history of the notorious Nuremberg (Race) Laws. The laws were clearly not a knee-jerk last minute reaction by Hitler in the midst of the Party Rally of September 1935, as conformist historians have argued, but prepared weeks ahead in Berlin and after sobering remarks by Dr Hjalmar Schacht at a full scale Cabinet-level conference on August 20, at which all the ministers and Reinhard Heydrich were present, warning of the disastrous economic effects of the Jewish boycott against the German economy. I write to Hugo in Berlin about this discovery. "Here are some of the notes I made last night. 15. Abhandlung by Dr jur Rudolf Becker, Einführung der Judensgesetze, Apr 6, 1933 (4pp). Entwurf zu einem Gesetz zur regelung der Stellung der Juden. (6pp). Historische und Statistisches Material zum Judengesetz, going back to 1812 and earlier, including statistical data of the provinces and cities (ca 20pp). Letter from der Sachverständige für Rasseforschung beim Reichsministerium des Innern, to Heydrich, Apr 10, 1935, enclosing letter to Hess with a draft Sippenamtsgesetz. 16. Vorgeschichte der Nürnberger Gesetze, 1935: Letter Körner to Gestapo, Jul 26, 1935: Göring is planning allg. Richtlinien für die Behandlung der Juden, wants the violent anti-Jewish Kurfürstendamm etc. demos meanwhile to stop as they damage Germany's prestige. Draft letter by Justizsekretär Herrmann(?) to Heydrich, Jul 31, 1935, with suggested contents of a law, and final version. Several drafts of a Geheime Staatspolizei letter, August 1935 (9pp). 17. Reichswirtschaftsminister Schacht warns all ministries and the Gestapa of serious economic consequences of the ongoing Bekämpfung des Judentums, Aug 13 1935, 2pp. On Aug 15, 1935 Schacht calls a Chefbesprechung on the 20th. Pfundtner, of Reichsministerium des Innern, asks Aug 15 for postponement of that Besprechung um etwa eine Woche, to enable his staff to prepare and in particular to allow der Leiter der für Judenfragen zuständigen Abteilung to return next week from a Krankenurlaub. Schacht says urgency does not permit any postponement. Four pages of stenographic notes on a meeting on Aug 20, 1935 follow. Gruppenführer [Heydrich] speaks on page 3. 18. A typed 11-page Bericht über die am 20. August im RWiMin stattgehabte Besprechung über die praktische Lösung der Judenfrage unter Vorsitz von Schacht. Popitz against Stürmer-Hetze. Gürtner says: dass das Rassegesetz bald verkündet würde. Heydrich makes four practical suggestions.